Light offerings and recitation of prayers and praises. This is the annual celebration of the life of Lama Je Tsongkhapa, Losang Drakpa (1357-1419), the founder of our lineage. various prayers and readings, as recommended at 8pm. Without doubt Lama Tsongkhapa is the one father of all the Victorious Ones, which means Manjushri. That is proven by logic and by stories about him. Strong, definite faith comes from hearing those many quotations in regard to him, principally from Guru Shakyamuni Buddha. In the Manjushri Root Text Buddha says, “After I have passed away, you will in the form of a child perform the actions of buddha.” Also Guru Shakyamuni Buddha said, “At that time a monastery called “Extremely Joyful” will be founded”, which refers to Gaden Monastery. 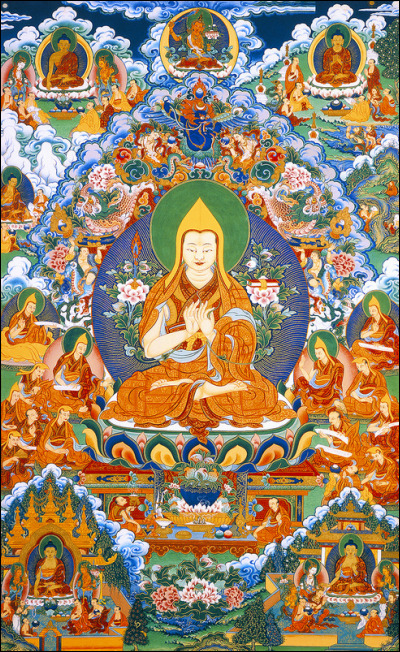 All the buddhas of the ten directions abiding in the infinite pure fields say, “Lama Tsongkhapa is a very brave-hearted bodhisattva, the holy being who clarified the teachings of Nagarjuna and Asanga, the great propagators of the profound and extensive teachings of Buddha.” Hence (the epithet) “Tsongkhapa, the Dharma King of the three realms, Losang Dragpa”. At one point, he studied and analyzed the entire Kangyur (bKa’-‘gyur) and Tengyur (bsTan-‘gyur) – the translated direct teachings of Buddha and their Indian commentaries. After that, at age 32, he wrote A Golden Rosary of Excellent Explanation (Legs-bshad gser-phreng), a commentary on Filigree of Realizations and thus on prajnaparamita. He synthesized and discussed all twenty-one Indian commentaries. Whatever he wrote, he substantiated with quotes from the entire span of Indian and Tibetan Buddhist literature, comparing and critically editing even different translations. Unlike previous scholars, he never shied away from explaining the most difficult and obscure passages in any text. If we look at his life of only 62 years, and consider how much he studied, practiced (including making tsatsa clay statues), how much he wrote, taught, and did retreats, it would seem impossible that anyone could do even one of them in a lifetime.